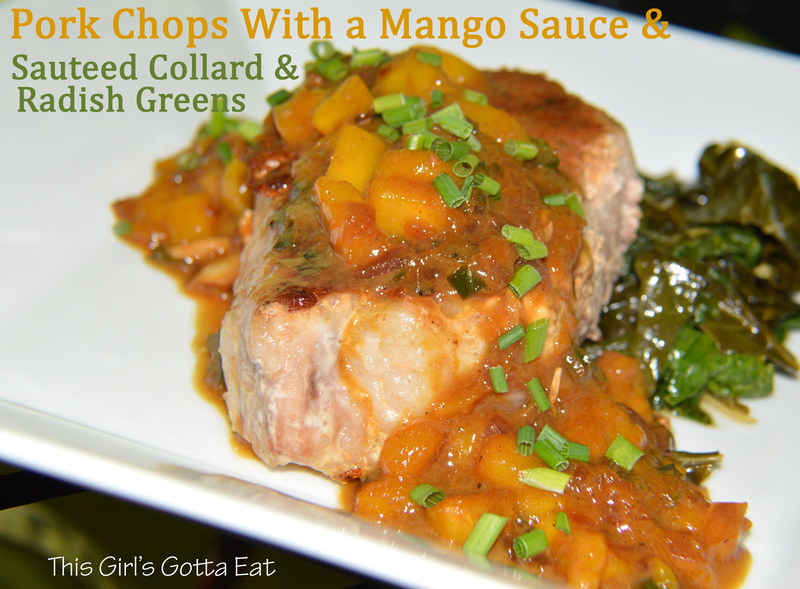 Pork Chops With a Mango Sauce and Sauteed Collard and Radish Greens | This Girl’s Gotta Eat! This week’s share from Fresh Fork Market is loaded with greens, like collard greens and Swiss chard, as well as beautifully thick-cut pork chops and crunchy veggies like radishes and kohlrabi (more recipes to come with the other ingredients). I’ve never made collard greens, so I found some inspiration from Tyler Florence to assist. While the greens were cooking I thought, why not sneak the radish greens in there too – so that’s exactly what I did! Any other time I may have discarded the tops, but these days I am trying my best not to let any of our Fresh Fork ingredients go to waste. This is a delicious meal with a little heightened southern elegance, great for a weekend date night at home! To prepare the collard greens, remove the stalk and tough parts of the stems. Rinse thoroughly and dry. Tear the leaves into bite-size pieces. Meanwhile, heat a couple of Tbsp of olive oil in a large skillet or pot over medium heat. Once the oil is hot, add crushed garlic cloves and a pinch of red pepper flakes, and saute until fragrant, about a minute. Add the collard greens and toss well to coat in the oil. Next add the chicken broth and vinegar. Cover, and cook until tender, 30-35 minutes, stirring occasionally. During the last 5-10 minutes or so, add the radish greens and cook to wilt. Season with salt and pepper to taste before serving. Remove pork chops from your fridge at least 20-30 minutes before you start to cook to bring to room temperature. Dry well with a paper towel. Heat some olive oil in a cast iron skillet over high heat. Season pork chops on both sides with salt, pepper and garlic powder. Once the pan is very hot, add the pork and brown 3 minutes per side. Transfer chops (right in the cast iron skillet) to the oven and bake for 15 minutes. Remove from the oven, transfer pork to a plate and tent with foil to rest, at least 5 minutes. While the pork rests, make the sauce in the skillet you used to cook the pork. Over medium-high heat, saute the onion and pepper until softened. Deglaze the pan with wine and cook, until reduced a little. Add the mango and cook until thick. Depending how thick your sauce is, you may want to thin it out with a little chicken broth. To serve, dish out the collard greens, top with a pork chop, then top with mango sauce. Garnish with green onions, parsley or chives. You can serve with a starch if you want or a salad. You mean you can eat radish greens? Amazing! They’re a little prickly raw, but they soften once sauteed!